This app add automatic loudspeaker during call. Just remove phone from your ear and loudspeaker will enable, bring to ear and it will switch to internal speaker. This app utilizes phone’s internal proximity sensor. Compatible with S^3 / Anna / Belle Smart Phones. – answer on ‘volume +’ press (work during ringing and alering). 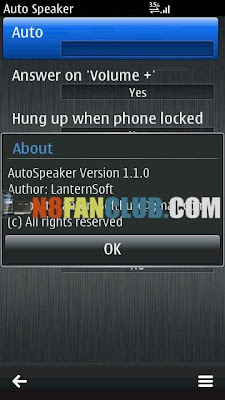 – hang up on phone lock (workduring ringing, alerting and call). – vibration on answer and hangup (when vibra are active in profile). We will add additional phone lock behaviours in next update.